Healthy Eating: How I spent my Valentines day! Sorry I didn’t post anything yesterday but I was kept busy doing some special things for my Husband. 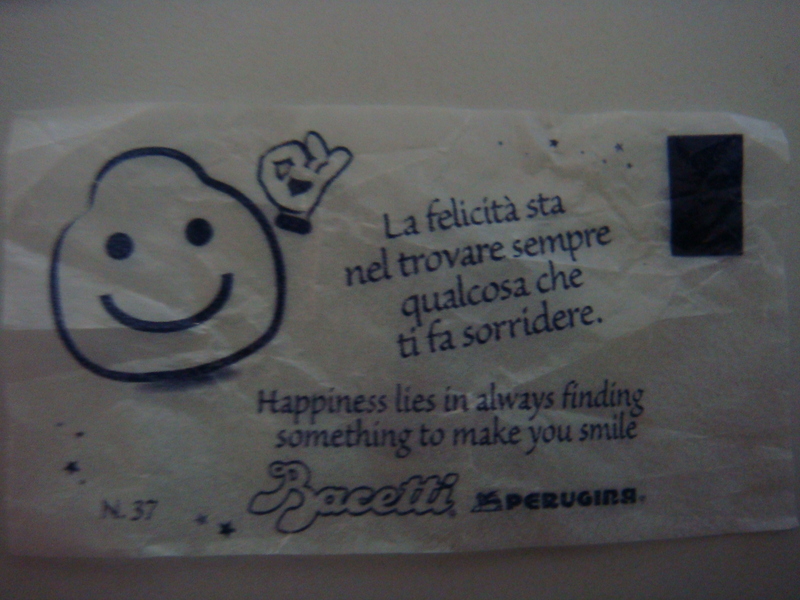 This is the first Valentine’s Day in Italy and also the very first we weren’t able to celebrate with a little wine or bubbly (or should I say I couldn’t drink)…. I take my responsibilities seriously and “the little Buddha” growing inside my belly was far more important than drinking, (although I really would’ve enjoyed it). 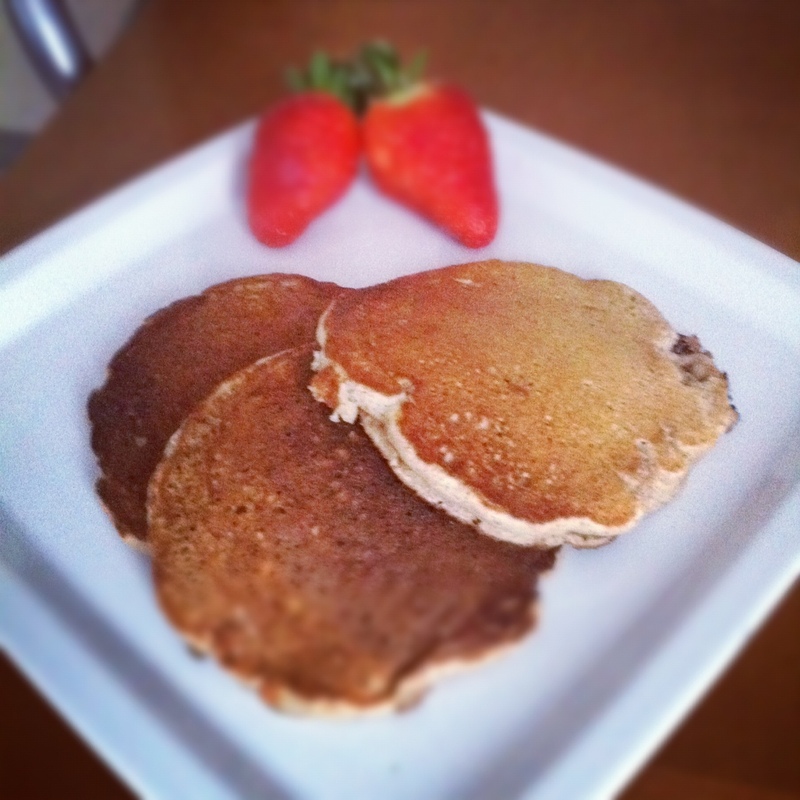 My Husband has been asking for pancakes for a few weeks now and I finally decided that when Valentine’s day came along I would wake up and make some pancakes for him, I am trying to still eat healthy throughout this pregnancy so decided that I would go ahead and make healthy whole wheat pancakes. I did some research online of course to make sure that I had the right ingredients and also to see what recipes stuck out to me, I have to say that not one in particular did stick out to me, some called for buttermilk, others called for butter, some had a mixture of regular white flour and whole wheat flour so I decided that I would make them my way. They came out delicious and fluffy, that was my biggest fear being that they would be whole wheat I was afraid of them being heavy and not so exciting to eat. Well they came out fantastic….and the cappuccino along side was perfect! In a bowl large bowl combine flour, sugar, baking powder, cinnamon and salt. In a separate bowl beat your egg whites with a mixer or whisk until stiff peaks. In a separate bowl beat milk, yolks and vanilla until foamy. Add milk mixture to the flour and stir, (it’s ok if a little lumpy) fold in your egg whites and stir until evenly colored. Heat your griddle or pan and add very little vegetable oil to the bottom and distribute evenly with a paper towel, once the pan is hot pour in your batter. Allow top of pancake to bubble and then flip and cook for another 2 minutes.You may serve with whatever you like. We served ours with strawberries and maple syrup. Enjoy. After a delicious and healthy breakfast we both went off to run errands, work ..the usual. For dinner we decided that we would cook together so we started. My husband has been getting more and more into cooking as the years go by and likes to help out whenever he can and possibly learn a couple of things, which I am happy about because it’s nice to be cooked for once in a while. We both decided that we wanted a light and fish based meal, it ended up being 3 courses but extremely fast and easy. 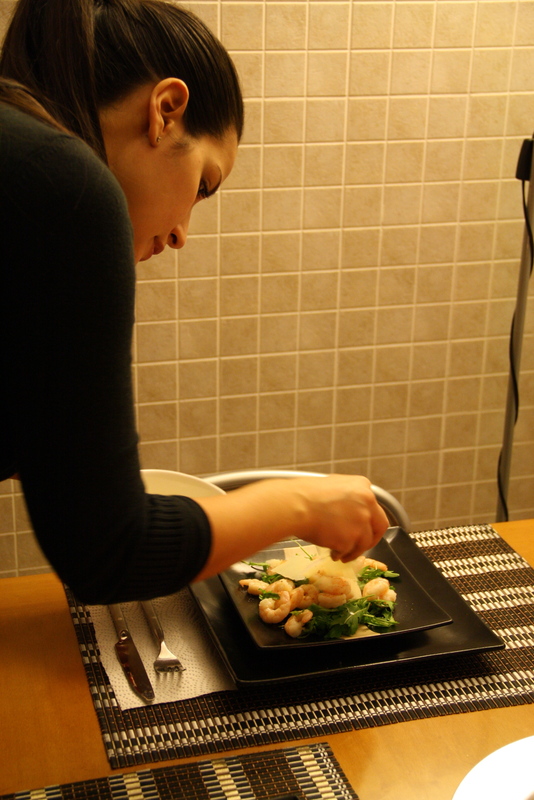 For the “antipasto” (starter) we decided to have “Gamberi con rucola e grana” which is very common to eat here and simple; it translates “Shrimp with arugola / rocquet and parmigiano”. Boil your shrimp. In the meantime wash your arugola/rocquet and set aside. Grab your Parmigiano and make your flakes with a knife (just enough to put on top of dish). Drain your shrimp (remember shrimp cook fast, once they turn pink they are pretty much ready). Lay arugola/rocquet at bottom of plate, add your shrimp and drizzle 1 tbsp. of olive oil and salt to taste. Now you may add your flakes of Parmigiano and enjoy! If you like you may drizzle a bit of Balsamic vinegar over top. 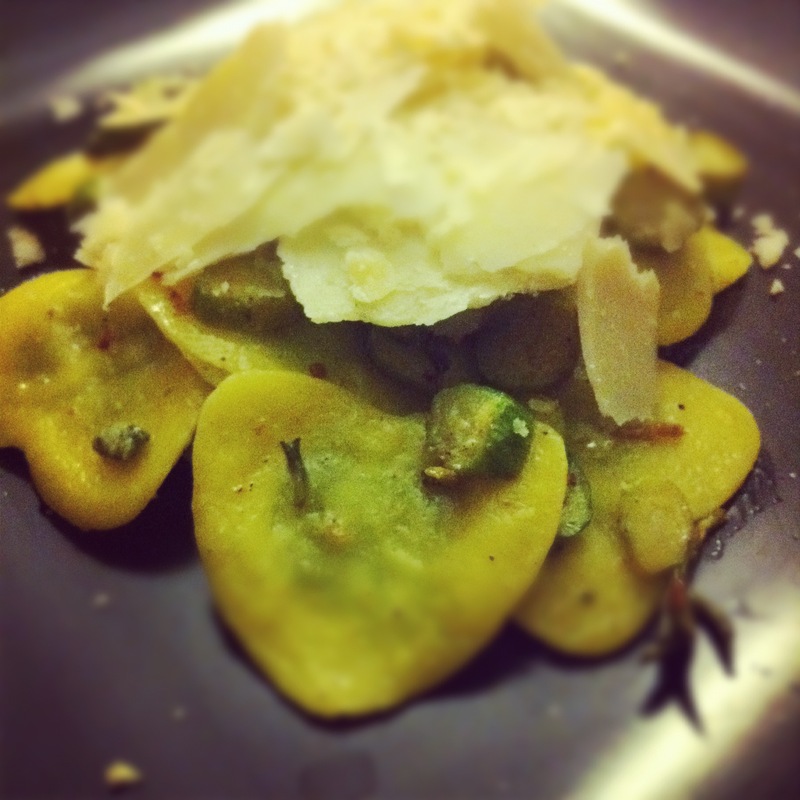 For the “primo piatto” which means “first course”, we had “Ravioli a forma di Cuore, riepieni di Ricotta e Spinaci, in salsa di Asparagi e Salvia” handmade (bought though) heart-shaped ravioli filled with ricotta and spinach, with an asparagus and sage sauce. Put a pot of salted water to boil. Meanwhile grab your asparagus, chop the stems off and then slice them into 1/4 inch thick. In a medium saucepan place the olive oil, once heated add your asparagus and allow to cook at medium flame for about 5 minutes, now lower heat and add your sage leaves, red pepper flakes and salt and allow to cook for another 5 – 8 minutes. At this point your water should be boiling so throw in your ravioli and allow to cook for the time indicated on the package. Drain, and put in the saucepan with the asparagus add your margarine and mix until everything is fully coated. 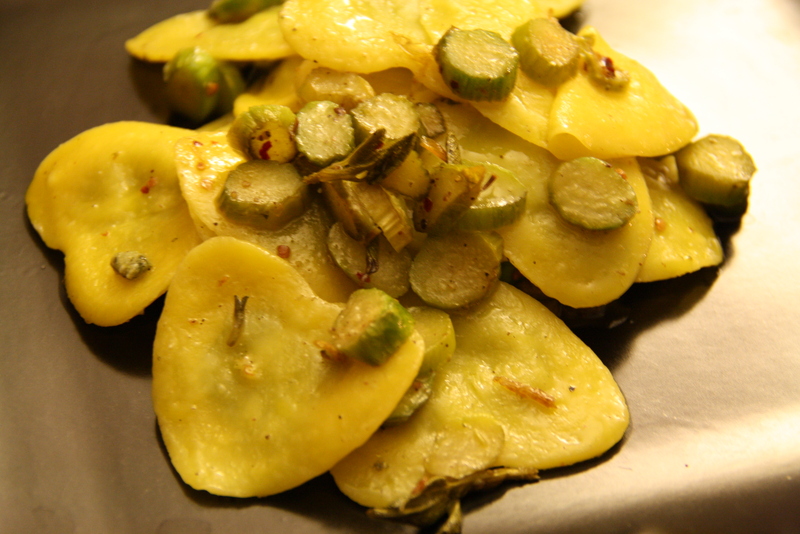 Begin to plate, add your parmigiano flakes and Enjoy. 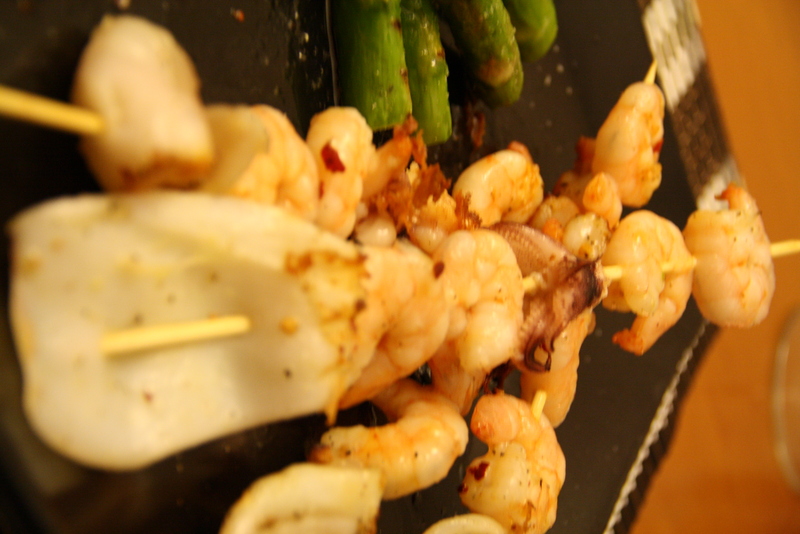 Then for the “secondo piatto”; our “second course” we chose to have some “Spiedini di Gamberi e Calamari con Asparagi alla griglia” which translates into “Shrimp and Calamari Skewers with grilled Asparagus”. It turned out wonderfully and a great end to the feast. Turn on your grill to medium and allow to heat (I used my stove top grill because it’s snowing outside). Steam your asparagus for about 5 minutes, set aside. Grab a medium bowl and throw in your shrimp and calamari, pour a little olive oil on top, add red pepper flakes, salt and pepper, mix it altogether and start to skewer, some shrimp, a calamaro, some shrimp; on to the next. Once you are finished you may bring over to the grill and allow to cook, about 5 minutes on one side and then flip; don’t overcook. Always remember that once the shrimp turns pink on both sides it’s cooked. Add your asparagus as well and allow same cooking time as skewers and then flip. 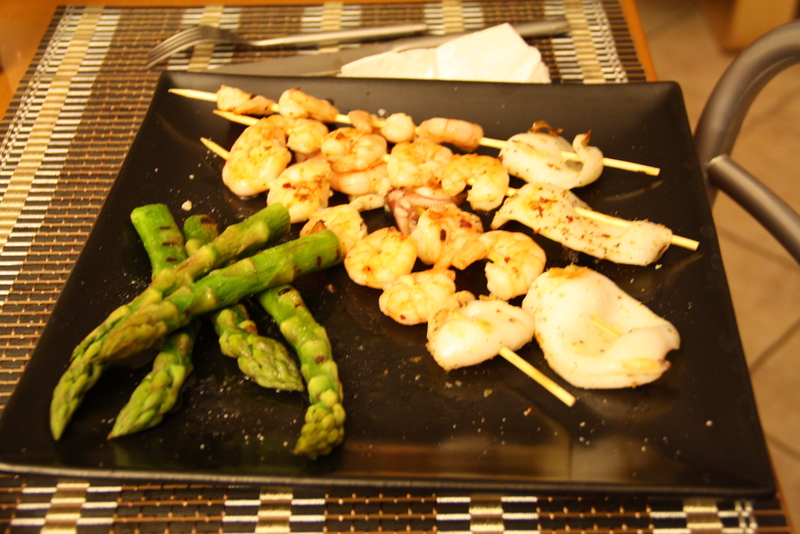 Once your done plate, drizzle some olive oil over your asparagus and ad salt as well. 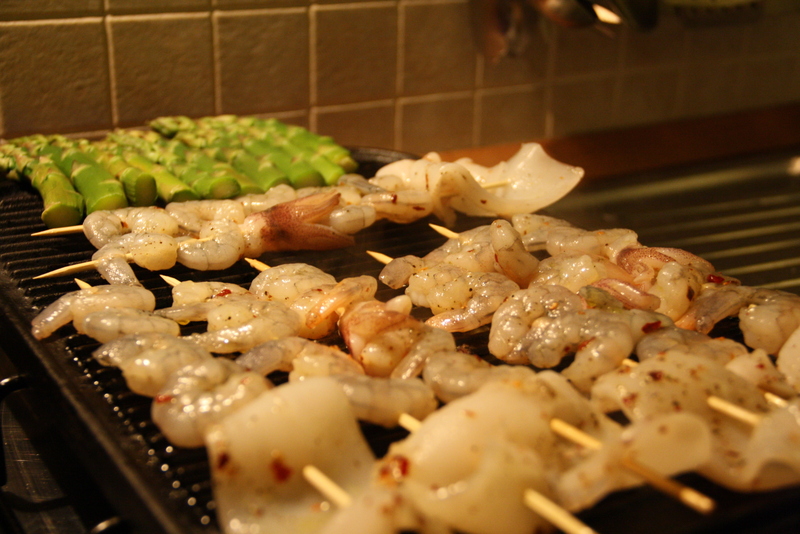 Squeeze lemon over the skewers and enjoy this dish as well. I hope that you guys have enjoyed the recipes. I know this looks like a lot, but it wasn’t; it was simple and we really enjoyed cooking and eating what we had made together, it was a nice experience and my husband was a wonderful help. We topped it off with a Chocolate “Bacio” and Tiramisu (but this recipe is to still to come). We ended up watching Casablanca because neither of us had ever watched it and it was a nice stay at home, just us night. We figured that this is the last Valentine’s that we were going to have our house all to ourselves before the “little Buddha” comes and we wanted to enjoy it to the fullest…..and of course the fact that I just felt too lazy to go out in the cold weather with this belly and all. But it was nice to know that after being married for 7/12 years we can still enjoy each others company without having to necessarily go out, and without wine. P.s. I am about 23 and 1/2 weeks pregnant, sorry about the cleavage. This entry was posted in Favorite Foods, Other Things about Me, Pasta & All Carbs, Seafood, Signature Dishes, Vegetables, Vegetarian and tagged Asparagus sauce, Calamari Skewers, Lactose free pancakes, milk mixture, pregnancy meals, Rocquet appetizer, Rucola, Seafood dinner, Shrimp, Shrimp appetizer, Shrimp skewers, Spinach ravioli, valentine s day, Valentines day menu, Valentines for your husband, whole wheat flour, whole wheat pancakes, Wholewheat pancakes by Balanced Modern Mom. Bookmark the permalink. Thank you very much!! It turned out to be delicious and fun. Yum! Those pancakes look just right! sounds like a perfect day together with quality time and delicious food! It was a quality day, it’s so fun and nice to share with people that you love. Thanks for stopping by mythineats. Looks delicious! Thanks for the healthier pancake recipe; we’ll have to try this. I’m trying to use more whole wheat flour and less regular these days. 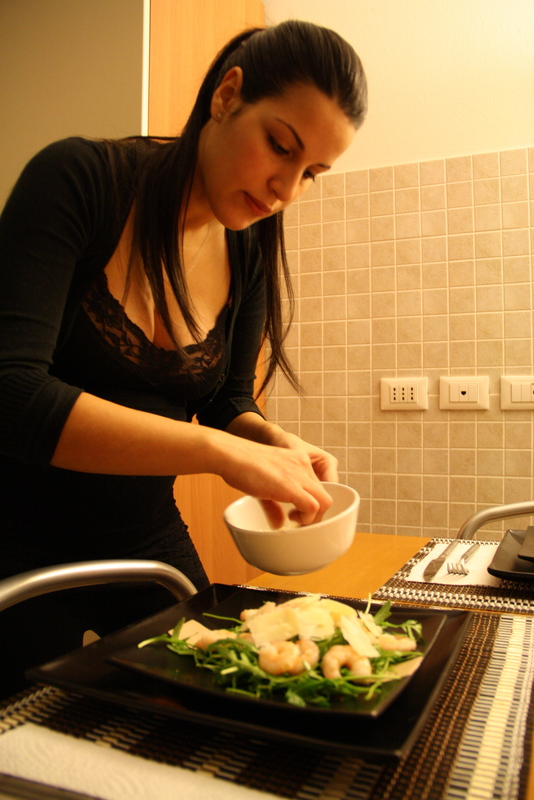 Keep up the healthy pregnancy eating – you will be so happy you did later! I wish I had done a better job of that myself!! Why Thank you! I tried to make something that wouldn’t take away too much time from being able to spend time together and I have to admit this turned out great. Thank you for the Congrats.